300% ROI in one year. Double or triple your investment in one year. One RYO Filling Station will typically provide a whopping 300% ROI in the first year of use, running at just 45% capacity. 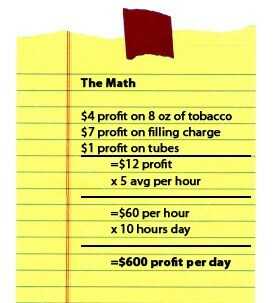 No other tobacco related product in your shop can match the margins that the RYO Filling Station provides. Typical margins on premium cigarettes range from 6% -8%. You can expect a 20-30% margin on a use of the RYO machine in your store. Stores with the RYO Filling Station are typically reporting daily revenue increases of $500 to $600 per store. If you are questioning the RYO volume potential in your shop, know this: you will turn a small profit with as few as five customers per day.